DEFUNIAK SPRINGS — Jordan Albert Martin, 77, of Rt. 1, Freeport, died Monday night in a local hospital. 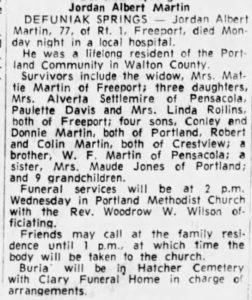 He was a lifelong resident of the Portland Community in Walton County. 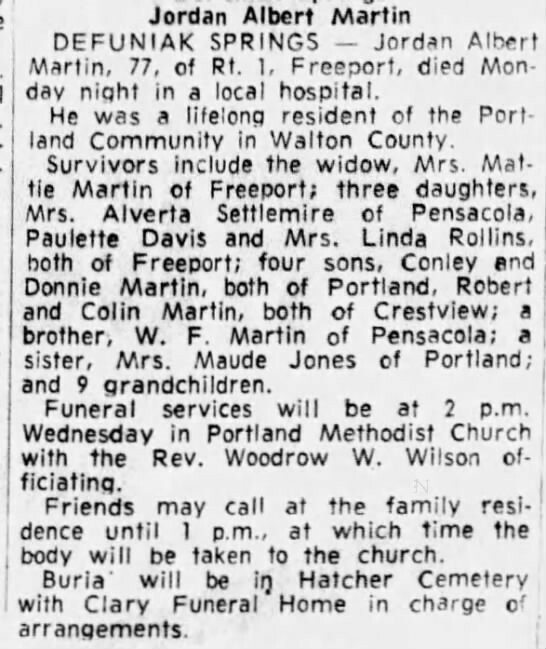 Survivors include the widow, Mrs. Mattie Martin of Freeport; three daughters, Mrs. Alverta Settlemlre of Pensacola, Paulette Davis and Mrs. Linda Rollins, both of Freeport; four sons, Conley and Donnie Martin, both of Portland, Robert and Colin Martin, both of Crestview; a brother, W. F. Martin of Pensacola; a sister, Mrs. Maude Jones of Portland; and 9 grandchildren. Funeral services will be at 2 p.m. Wednesday in Portland Methodist Church with the Rev. Woodrow W. Wilson officiating. Friends may call at the family residence until 1 p.m., at which time the body will be taken to the church. Burial will be in Hatcher Cemetery with Clary Funeral Home in charge of arrangements.